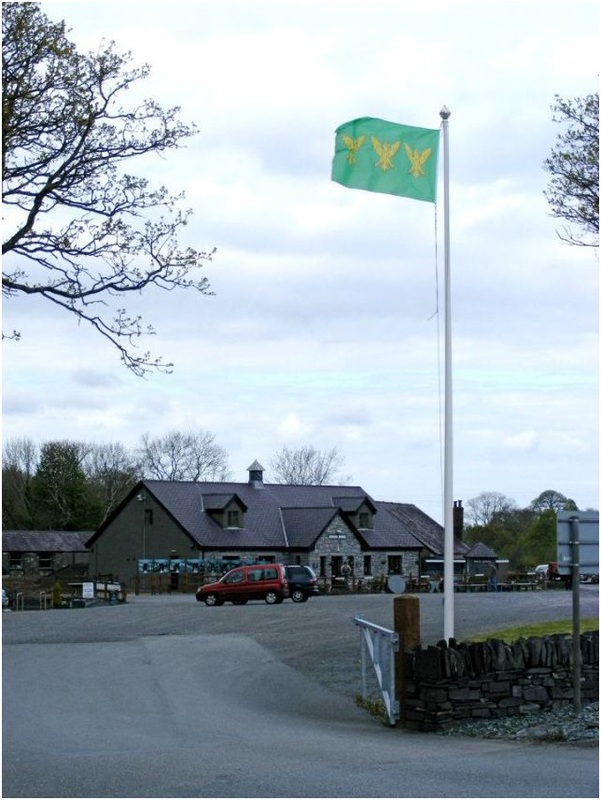 The flag of Caernarfonshire was registered in March 2012 following extensive research into its history by the Association of British Counties. 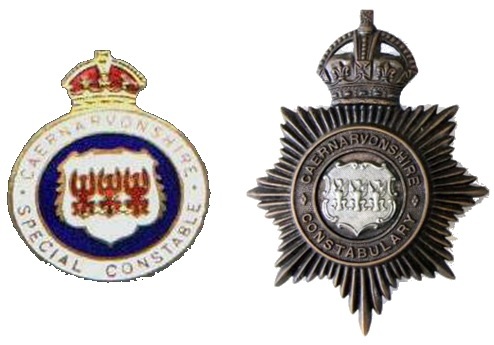 Whilst the link between the emblem of three golden eagles on a green field and the county of Caernarfonshire is seemingly ancient, the loss of the county’s status as an administrative entity and the disappearance of the county constabulary, appeared to have resulted in the loss of recognition of its “three eagles” emblem. 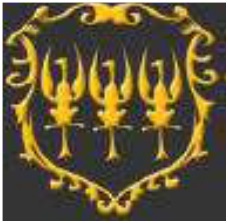 The imposition of new administrations with novel insignia meant there were few instances where the three eagles symbol might continue to be used and so remain familiar with the local populace. 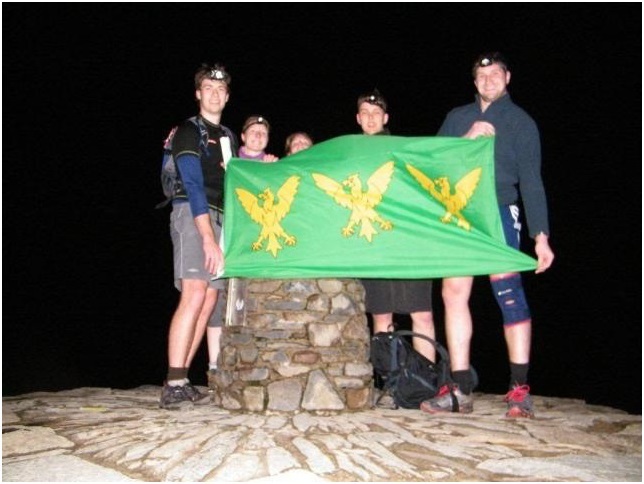 However, the eagles were more real than apparent as they were still to be found amongst older county based organisations, attesting to their status as the legitimate option for deployment as the county flag. of the 12th century king, Owain Gwynedd, king of the erstwhile kingdom of Gwynedd. Born before the heraldic era, these were nonetheless anachronistically assigned to the king in typical mediaeval practice. 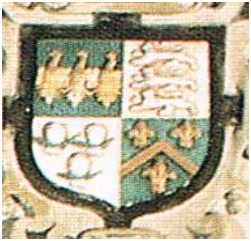 Michael Powell Siddons in his work ‘The Development of Welsh Heraldry’ finds the earliest reference to the arms to be in the late fifteenth century work of the bard Gutun Owain with the earliest full description of the arms appearing in the manuscript of Thomas ap Llywelyn ab Ithel circa 1562. However the emblem seems to be one of some antiquity. 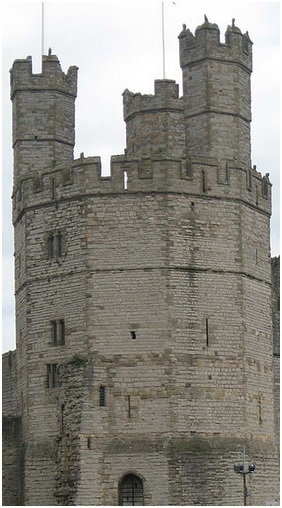 of Caernarfon Castle, completed in 1284, which has three turrets, each of which was topped by a stone eagle. 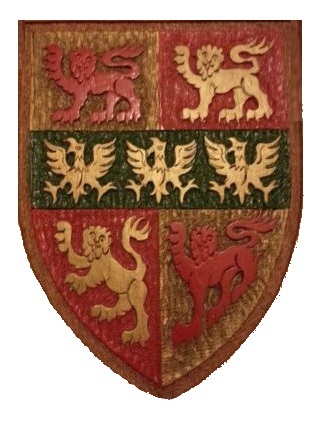 for Wynn of Gwydir, descendants of Maredudd from sixty years later which also includes the eagles. 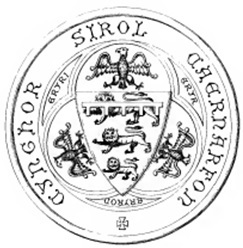 “Those of Caernarfon not the least in speed,…Three golden Eagles in their Ensigne brought”. 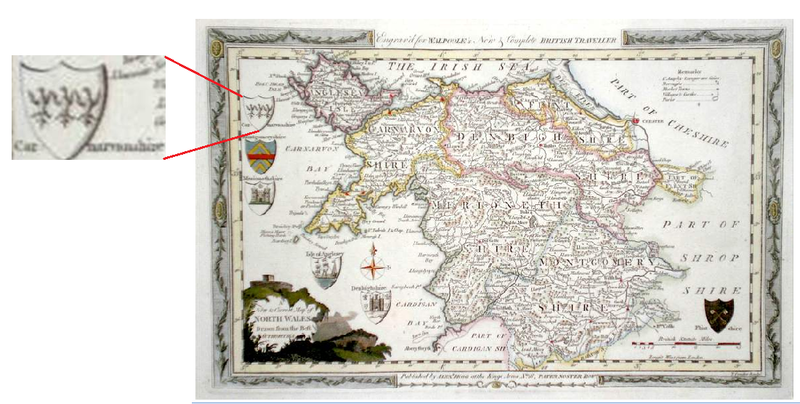 The three eagles are seen again on Thomas Conder’s 18th Century “British Traveller” map of north Wales, where they are unequivocally designated as “Carnarvonshire”, amidst several emblems. An illustration of these is included in the 1915 update of this work. and they appeared on a military flag. In his “History of the Welsh Guards” C. H. Dudley-Ward includes a page of illustrations of company colours; that of number two company features the gold eagles on green at the hoist. 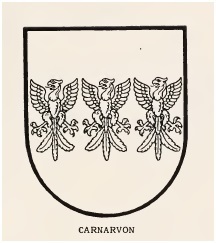 and a decade earlier in his work on county identities ‘The Story of the Shire’, Frederick Hackwood called the three golden eagles of Caernarfonshire an “authentic” and “significant” badge of the county, as well as reciting their association to the Romans of antiquity. albeit, in contravention of strict heraldic procedure! See here, page 10. 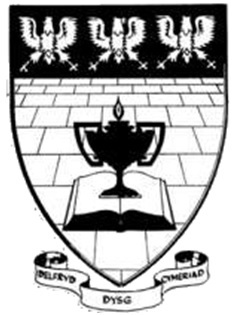 An old copy of the school magazine dated from December 1968 and significantly entitled Yr Eryr (The Eagle) states that the badge was designed by the school’s art teacher Mr. John Davies and depicts the “Eagles of Snowdonia”. 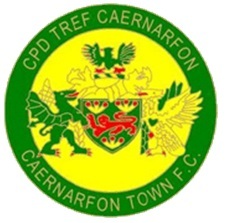 It further informs that the eagles are yellow on a green background, the traditional colour scheme for this emblem. 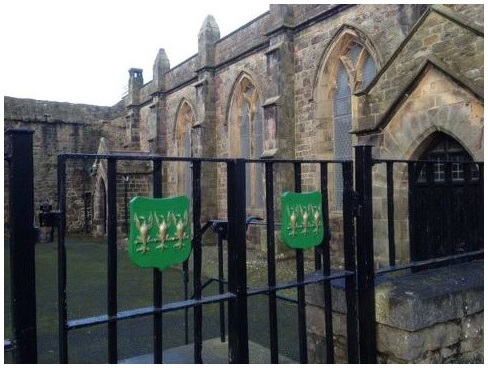 Three golden eagles on a green shield further adorn the gates of St. Mary’s Church in the town of Caernarfon. Bethesda Cricket and Bowling Club. 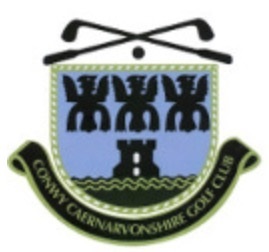 and again, in a stylised form, at the top of the badge of Conwy Golf Club, located on the county’s coast. 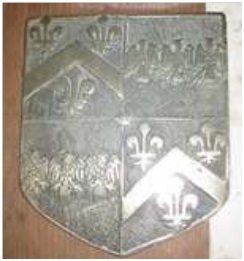 Owain Gwynedd’s arms are also in evidence at battle re-enactments and commemorations. 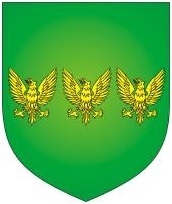 In light of this extensive use of the eagles emblem to represent the county and county organisations and its long historical association with the county, it was determined that there could be no more appropriate symbol for use as the Caernarfonshire flag than the traditional three gold eagles on a green background. 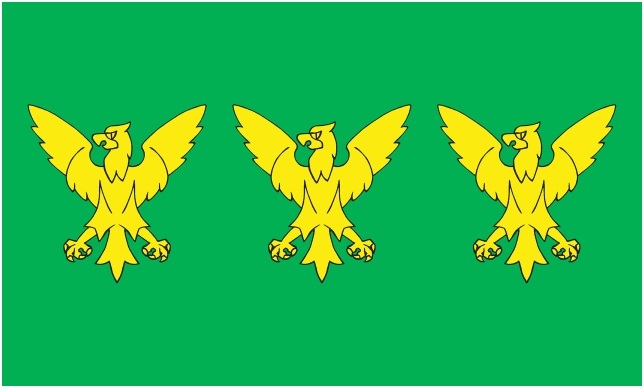 A campaign to see this design registered as the Caernarfonshire flag was taken up by local resident Gwyndaf Pari, who campaigned for local support via publicity in the local media. He is seen here at “The Black Boy Inn” Caernarfon, with the flag. 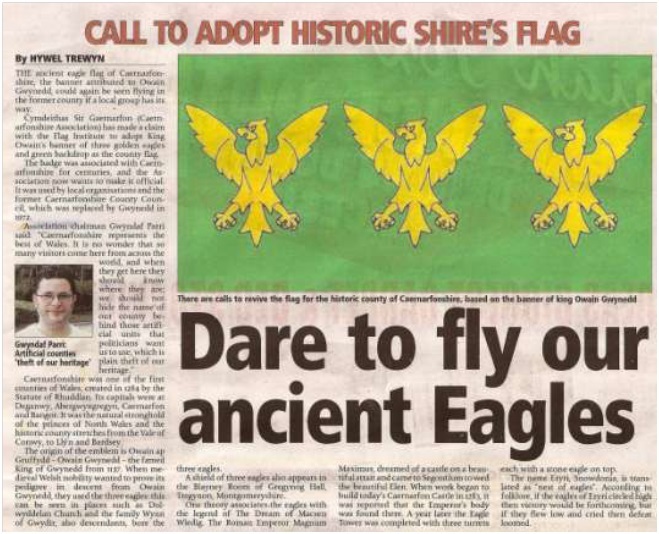 Recognising the undisputed historical and cultural status of the proposed flag, bearing the acknowledged county emblem of three eagles, the Flag Institute consequently registered it as the Caernarfonshire county flag, . castles, including on the eagle tower, which may have inspired the original arms and most significantly of all, displayed at the county’s highest point, the summit of Mount Snowdon. magnificent polo shirts proudly bearing Caernarfonshire’s three eagles! With thanks to Philip Tibbetts for his research on this topic. 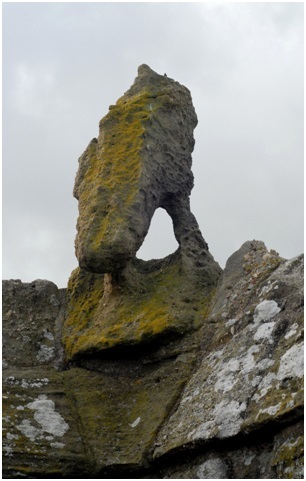 This entry was posted in Caernarfonshire. Bookmark the permalink.